I'm so glad you see you here! While you're visiting, would you like to read a very cool post but one of our well known blog friends? It's Miss Terra over at Sitting On an Oak. To read her wonderfully thought provoking link, just click here! Bravo, Terra! Loved your writing on this! Today I have a few Y's to share. Y? Because I found the letter inspiring. I actually came up about 11 ideas and then I had to curb my enthusiasm. But I'm still pretty enthusiastic about these signs...my favorite is the set of 3! This is small. Only 8" x 8" but it made me laugh. 8" x 18" Different in yellow and grey. And here is the little set of three signs! I love these. You could hang them horizontally OR vertically. Each sign is 8" x 8" square. Each sign is linked to its Etsy listing. Just click on any that catches your eye. To visit other links to the letter "Y", just click here. I like yadda yadda yadda...so cool! You were certainly on a creative roll with this letter! I love the second one. 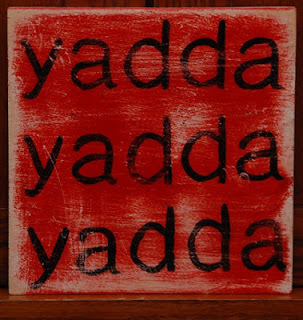 I love the Yadda, Yadda, Yadda. You made me laugh out loud. I can so relate to the second one. Clever way to cover the letter "Y". Hit the other posting about CO and found the comments just as interesting as the actual post. These came out great! You are so talented! your creativity did a very good job ! Loving the signs Jen! Keep on arting! these are so great, Jenny. just wonderful. Those are SO cool. Love them, Jenny! I guess my favorite is the yellow yesterday one. I think I have a thing for song memories! Great post and terrific "signs of the times!" Thanks for your report card! You are a gem! More good ones -- they just keep coming! yadda yadda yadda! YES! YES! YES! Gotta love the yadda yadda yadda one! Jenny these are ALL so special! You're so creative with each painting! They are fantastic!